Asterism Clean is a calligraphy style font created by Molly Jacques Erickson & Dathan Boardman and published by Great Lakes Lettering that should need no introduction. 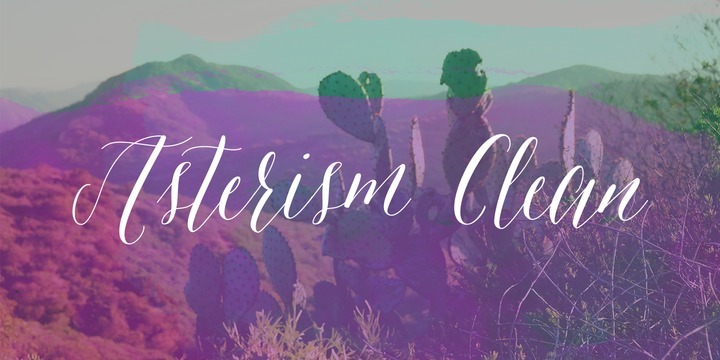 Asterism Clean is the smooth lined version of the very popular Asterism. In typography, asterism represents a three start symbol. Based on Molly’s own drawing style, Asterism Clean has a moving baseline and lots of shining personality. It works best when is paired with Frosted, Icing, Saint Agnes. A new star is born, Asterism Clean! A font description published on Friday, April 24th, 2015 in Dathan Boardman, Fonts, Great Lakes Lettering, Molly Jacques Erickson by Andrei that has 6,184 views.